NOW I HAVE TO GET SOME 20-SIDED DICE . . .
Well, I finally lost my Dungeons & Dragons virginity, my New Year's resolution being to fill in this one gap in my claim to be Queen of the Geeks. 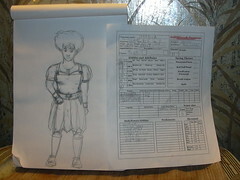 Here's my character, Jfroella-of-the-Glade, and her stats. Thanks to Dr. S for being a great Dungeon Master. That one episode of Freaks & Geeks has more meaning to me now. if anyone is interested in playing RPG's, let me know. I would enjoy being a cyborg or a ninja or a space cowgirl as well. I've got the Dungeon Master's Guide. I've got a 12-sided die. You were a good sport when the tree man, the orcs, the wereboar and all the other nasties you ran into kept knocking you out! Glad you lived to tell about it my fair Jfroellen!